According to ESLC Executive Director Jesse Dixon, the goal of the ESLC Upward Bound programs is to help people reach their educational and career objectives. “We have a long history of providing effective college access programs to high school students, and we are happy that we have received funding to build and expand upon that tradition,” Dixon said. The U.S. Department of Education administers the new ESLC Upward Bound grants, which are in effect for the next five years and are listed below. First generational or low-income students, who are also veterans, will have an opportunity to achieve their career and academic aspirations through the program. The program is based out of the SIUE ESLC and is working in partnership with the Office of Veterans Services on the Edwardsville campus. The ESLC’s Workforce Development Program has been one good way to help young adults and adults realize career goals and find high wage-earning jobs, according to Dixon. The program will start with 60 high school freshmen and sophomores and follow the same cohort group for four years. The Scholars Academy provides cost-free weekly tutoring, pre-collegiate instruction, counseling and academic advisement, workshops on test-taking, critical thinking, goal-setting and study skills. “We also offer information on scholarship and financial aid availability, provide assistance in completing college and scholarship applications, provide educational and cultural activities and give career guidance,” said Salim Kenyatta, Scholars Academy educational advisor and instructor. The Math and Science (CM) program starts with a cohort of 60 freshmen. During the school year, the program will be offered during the school day at both Cahokia High School and Madison High School. During the summers, the students will participate in a residential program on a college campus. The ESLC has offered the following Upward Bound Programs for more than 50 years. 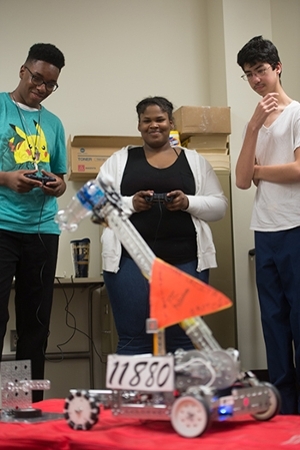 The SIUE Upward Bound Math & Science (ECM) program is designed to prepare participants for post-secondary education and motivate their exploration of science, mathematics and related education professionals. Participants receive tutorial instruction in science, technology, engineering, math (STEM), along with language arts, foreign language and more. 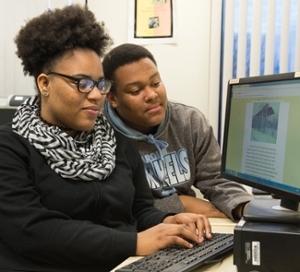 The program also offers a six-week summer residential component, where University faculty members instruct introductory courses in STEM, language arts, foreign language and computer literacy. Shown are students who participated in previous SIUE Upward Bound EC and BEM programs at the East St. Louis Center.